Nearly two months after unspeakable (and confirmed) allegations of sexual misconduct came against comedian/producer Louis CK, TBS has pulled the plug on the upcoming series. After CK conceded the allegations were true, FX effectively severed ties with the comedian, stating he would receive no further compensation for the productions. 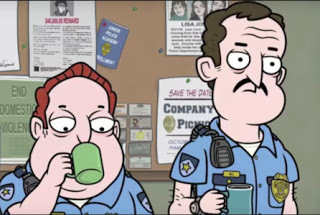 The Cops followed uniformed officials Al (Albert Brooks) and Lou (Louis CK) through their various mishaps and adventures. A. It is best to part with this series, as it will be a sore reminder of negative transgressions which went down prior to CK's art being displayed. B. The network should have retooled the premise and recast CK's role. C. Why allow art to be tossed before it can be showcased? CK's other productions are continuing to air long after he was removed from his post. Which opinion best describes where you stand regarding TBS pulling The Cops? Give us your feedback!